After hour eight-hour marathon drive, complete with minor breakdown, we could feel the adrenaline start to melt away as we finally pulled into the drive. The manager was waiting out front for us when we pulled up, called us by name. He brought us each an ice-cold washcloth and glass of tea sweetened with passionfruit juice. The reception area of Le Mirage Resort. It's interesting how many times in life there are small tipping points. Another sharp rock, another punctured tire, and we would have been spending the night in our fleeces looking up at the stars from the bed of a very dusty pickup truck, deep in the desert, wondering how to get a spare fixed in the morning. No sharp rocks? You get to spend the night in a little slice of paradise, a big soft bed and down comforter, cool washcloths, sweet tea, and enchantingly restful dreams. Given that we'd figured there was a fifty-fifty chance we'd be sleeping in the back of a dusty pickup, ... this'll do. While a visit to Namib-Naukloft was a critical part of our plans, Le Mirage was actually a bit of an accident. We weren't planning on staying there until some other plans fell through a few weeks before we left. We'd scheduled a two-night stay. The lodge, and nearby Namib-Naukloft National Park, were so beautiful, however, we ended up staying four. At this point we're very nearly precisely halfway around the world from home, in a land sufficiently exotic that the local Nama people speak a language that includes four different clicks. And, yet, when we walked into the restaurant for breakfast the first morning Way Down Yonder on the Chattahoochee was playing. Totally disturbing. Good wine. And great company. Our room and balcony. We spent many hours in the shade here watching birds and zebra come to the watering hole. It sounds like they frequently get hyena, and even the occasional leopard, as well. We spent most of our time in the nearby Namib-Naukloft National Park, hiking the dunes of Sossusvlei and Deadvlei, and exploring the depths of Sesriem Canyon. On our last afternoon, however, we decided to take them up on the offer of a quad bike tour. We ended up being very glad we did. 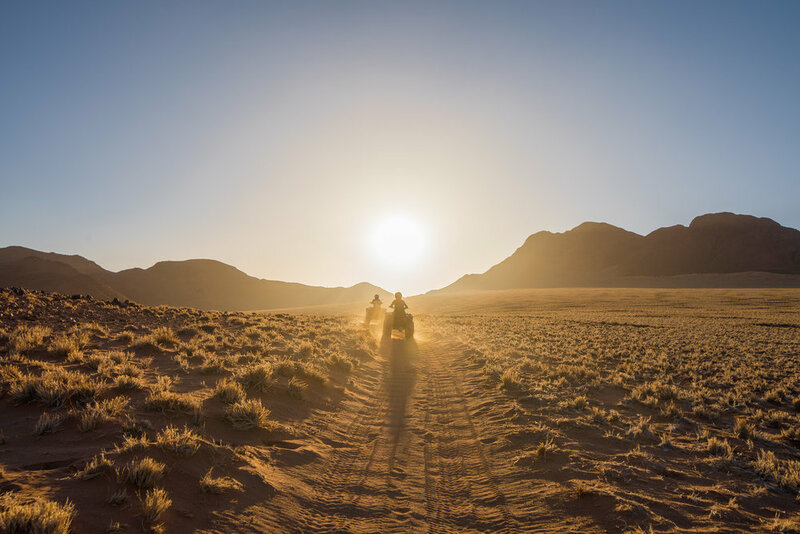 The two or two-and-a-half hour tour covered 50+ kms of amazingly beautiful and remote desert, with opportunities to see Fairy Circles, an African Moringa tree, and to watch the sun set from a nearby, windswept peak. Our guide, Sadrag, was all business at first ... and no more of that than necessary. There's your helmets. There's the throttle. There's the brake. Any questions? Okay, follow me. Once we got him talking, though, he turned out to be both very friendly and extremely knowledgeable. He stopped here to show us the African Moringa tree, which looks a good bit like a small Baobab. It grows on impossibly rocky hillsides and has its own guardian ant colony. We probably covered more than 50km during the tour, including out through some amazingly remote and beautiful valleys. Donna and I, normally lightly treading hikers, questioned how much we'd enjoy a quad bike tour. The answer was: very much. We got to cover much more ground and see areas far more remote than we ever could have on foot. One of the things I'd really wanted to see while we were in Namibia were Fairy Circles, rings of vegetation that have defied conclusive explanation for decades. Here I finally got to throw my shadow into one. Donna and Sadrag ride into the setting sun. Toward the end of the trip Sadrag led us up to a high col where we left our bikes and scrambled up the last 50 meters to the top of one of the nearby peaks. We peppered him with questions about the origins of Fairy Circles in a decidedly stiff breeze. And as the moon began to rise we headed back down from the pass, crossing back through a broad valley toward the hotel. Enjoyable way to spend an afternoon and evening! When we went over to the restaurant for dinner, one of the waitresses, Audrey, stopped us outside. We'd eaten inside the first night and outside the second. "Tonight you will not eat inside. Tonight you will not eat outside. I have something special planned for you. Is that okay?" We could only laugh, suspecting that "special" meant dinner in a closet in the back since we had just spent two hours banging through the desert on ATVs and were still covered head-to-toe in dust. Instead, she lead us outside, behind the restaurant, to where candle-lit stairs led down to the restaurant's wine cellar. "Is this okay," she asked. A full moon rises over the stairs leading to Le Mirage's wine cellar. A romantic dinner for two in the cellar. Could we, uh, ... just borrow a corkscrew? Yes. Very, very okay. Thank you, Audrey!